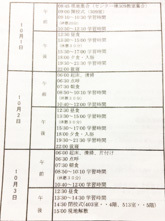 The second Monday of October is Sports Day (Taiiku no Hi). Most schools and local communities hold their Field Day or sports festival between September and this day. On October 31, Halloween is celebrated with costume parades in some towns and many Halloween goods appearing in stores, and the day has recently become a well-established and enjoyable event in Japan.